And the winners are: Frugal Follies, Deb P, Megan J, and Danielle. Check your emails and please respond within 48 hours with your mailing address so I can get your coupons in the mail! 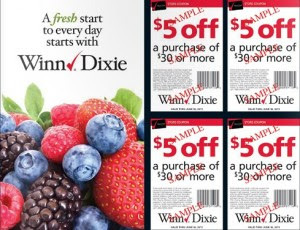 If you are a regular reader here, you know that I love using $5/$30 Winn Dixie coupons to lower my shopping totals at Publix. Many of you have asked where I get those coupons and the answer is Enjoy the City coupon Books! Enjoy the City books can be found for areas all over the country and not only do many of them have four of these amazing coupons in them but they have tons of other fabulous coupons as well. The books normally run for $20 a piece (and then pay for themselves with these Winn Dixie coupons) but I usually stock up on them during one of Enjoy the City's crazy sales. Since my Publix takes Winn Dixie coupons as a competitor, I pretty much never go shopping without one. Since I know that many of you would love to have these coupons to lower your weekly grocery totals I am giving away four of these coupons each to three different Couponing & Cooking readers.